Click on the cover and with your donation of $12.50 or a little more, you can get on the waiting list to receive the donor’s only expanded edition of this epic book, now with a new title Predictions 2019 and into the Roaring 2020s when it’s estimated publication is around New Year’s 2019. This epic book has been long delayed for three years because all of 2015 and 2016 saw me become a full-time caregiver aiding my mother through the final stages of her life to a beautiful passing on 15 July 2016. The process, conjuring big, life-altering changes, had made my return to full-time writing a gradual affair; however, there’s a hidden blessing in this. I believe this book by being delayed three years will now slot itself into the prophetic bi-annual time frame that is far clearer to explore in the climax of this momentous decade of the 2010s. Since 2017 dawned, I’ve been steadily catching up with publishing my back log of book assignments I’m obligated because of financial commitments to finish first. 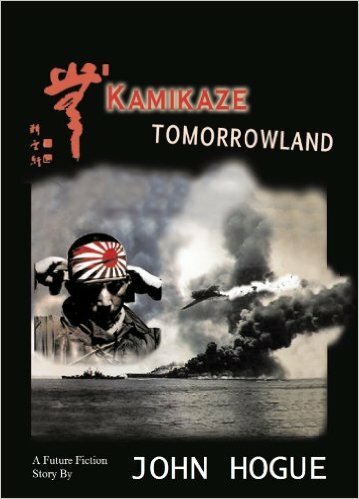 For those already on the list who ask, this is the same book with a new title updating the years forward from 2015-2016, 2018-2019 and now the new and final cover and title design. It’s prophecies will give you 24 months of forecasting starting with 2019, taking you through to the end of the 2010s decade and into tthe first year of the next decade. Everyone who’s already on the list for three years and counting will get this final evolution of this epic bi-annual book that will even be more breathtaking in its international scope forecasting these pivotal years of many crises, upheavals in politics and the climate and the potential breakthroughs possible only when the human race is faced with a collective, planetary emergency to stave off, together. To get the special, illustrated and expanded donor’s edition give $12.50 or a little more, and when its at last completed I will send you a PDF attachment of this expanded edition in return using the email address you sent with your Paypal donation. Not on the list yet? Please join it so you can receive the special donors only expanded edition as a pdf download of this book when it comes out in the new year. Only the Donors Edition will include extra features. One of these is an whole extra Appendix chapter entitled We are All made of God Stuff. Astronomer Carl Sagan in the award winning documentary Cosmos described all that we see in sky and on Earth, including each other, as “made of Star Stuff.” From big bang dust to stellar dust, in a great breathing out and breathing in of what the Hindu’s would call a Great Kalpa–an exceedingly long era of time, dozens of billions of years– the Universe breathes out from and retires back into the Unknowable to then breathe out cosmic appearances once again. This exclusive chapter takes Carl Sagan’s concept one big step deeper in understanding what is hidden underneath the veil of stellar dust that had formed and created all of us, all living and inanimate things, worlds, stars, galaxies and the dark matter that holds them. I define ScryFy as a form of prophecy-science fiction and fantasy. It is neither fiction nor non-fiction. ScryFy is transfix-tion. ‘Scrying’ is a basic form of divination using objects, like a magic mirror, or crystal ball, that, in the hand of the initiate, can reflect the dark shadows of potential future destiny. Let this new eShort Story Genre be your scrying tool reflecting back a blend of wisdom, fact, fantasy‚ and sometimes‚ real prophecies about alternative futures and true events to come from the ever transfix-tional world of the future. Having launched my writing career with the help of Ray Bradbury as an early, personal mentor, I’ve gathered a deep knowledge of Nostradamus’ texts and other prophetic traditions that, combined with his love of science fiction and fantasy, have given rise to this wonderful union of fact, fiction and prophecy in a new and captivating genre. 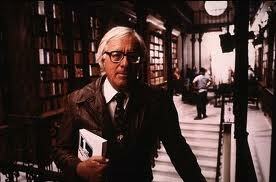 Ray Bradbury had a passion for supporting libraries. It was in such a place that I first met him. The meeting changed my life. Now I will come full circle in 2018, back to Fiction, launching a new genre. 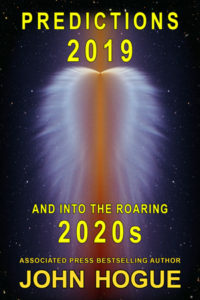 At the end of Predictions 2019 and into the Roaring 2020s, I share the first of ten ScryFy tales, for donors only. Be sure to put 2018 in the Paypal memo line or send me an email to hoguebulletin@hogueprophecy.com with just 2018 in the subject line. No need to write anything further. Downloads will begin in the order I receive them over the last two years. The date to be announced beforehand on all my media pages and the HogueProphecy Bulletin. IMPORTANT REMINDER: please use Gmail for best downloading results and please do not use the following email servers at all: Mindspring, Earthlink, Century Link, Cox Net, Charter, MSN, Telus, Roadrunner, Internet Explorer, or Peoplepc. If you use these old email address servers there’s a chance I’ll receive your emails but these older email systems will block you from reading my sending your PDF book by email and you’ll never be told why. It will look like I simply didn’t send it to you when indeed I had. Also, be advised, I cannot be responsible for you changing, or deactivating the email address you put on your donation. I certainly will be trying to get you your donors copy as best I can, but you’ll be responsible for contacting me about any email address changes, of course. And I trust you will. Send your email address along with a US check, US bank draft or US money order of $12.50 or a little more, payable to “John Hogue,” to the following address. Please print out your email address using a printer to ensure it is legible. Thank you for supporting HogueProphecy with your donation. I’m so excited to at last see light at the end of this long tunnel getting this epic book finished for all of you! I Keep hoping to get my order in snail-mail to you in time, but the last two years have been very challenging. Perhaps this one will mark a welcome change! Thank you for your wonderful programs on Coast To Coast A.M..
No worries, Susan. I’ll send you the expanded edition of Predictions 2016 whenever you can send your donation snail mail.